Anna University Nov Dec 2013 Exams for 3rd 5th 7th Semester got over and Students are waiting for their Results . In Meanwhile Anna University announced the Reopening Date for Even Semester 4th 6th 8th Semester. you can Check the Anna University Reopening Date 2014 for 4th 6th 7th Semester here. Anna University Exams for Regulation 2013 Students Starts by January 1st Week and Ends by Jan 3rd Week and Students are New to their Engineering Semester Pattern Exams. Rejinpaul.com Team Wishes you all the best. First year Students can get their Anna University Study Materials Such as Anna University Notes, Anna University Syllabus Regulation 2013, Anna University 1st Semester Important Questions, Exam Preparation Tips etc in our website. We are proud to mention that "we have become an part of all Engineering Students who are passing out every year for past 3 years". Result News Update on 20/01/2014 ( 06:30pm) Results to be declared with in another12 hours. 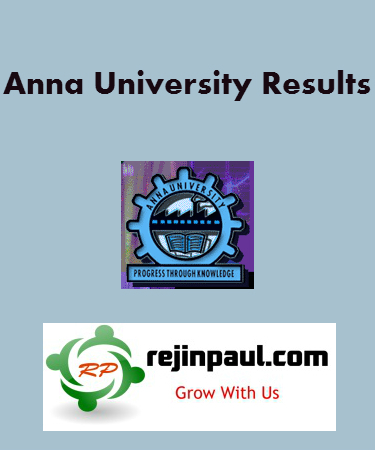 Anna University Results Nov/Dec 2013 3rd,5th,7th Semester UG/PG Results Will Be Announced Today Night Or Tomorrow Early Morning. Rejinpaul Result Update on 20/01/2014 ( 10:45pm) Results to be declared Only After 12 05 AM In the Morning ( i.e Tomorrow ) Anna University Results Nov/Dec 2013 3rd,5th,7th Semester UG/PG Results Will Be Expected Tomorrow Early Morning Between 1 AM - 3 AM Further any changes or updates will be intimated as soon as we get information. Rejinpaul Result Update on 21/01/2014 ( 06:00 Am) Result Publication is delayed due to delay in the work, Further updates will be intimated as soon as we get information.